Unwashed, uncivilized, bloodthirsty masses rampaging and pillaging—it’s the popular image of the Vikings, but there have been a number of archaeological finds that have truly made us rethink our image of the entire culture. And perhaps just as surprising is the fact that plenty of the stories which we thought were tall tales might actually be true. We have two main sources of information on Viking trips to the New World: The Saga of the Greenlanders and The Saga of Erik the Red. These sagas weren’t written down until several hundred years after the trips, so a lot of the information they contain has been taken with a grain of salt. While they’re pretty descriptive of what the Vikings were after on their journey and what happened when they got there, the sagas don’t say anything about what happened after the Vikings left. We know they did leave, but we weren’t sure where they went until recently. One source of contention is that the two sagas differ on the fate of Thorfinn Karlsefni after leaving the New World. Greenlanders says that he moved to Glaumbaer, Iceland, while The Saga of Erik the Red holds that he moved back into his original family estate. Of the two works, Erik is generally considered more accurate, but a recent archaeological find might finger Greenlanders as the true history, at least as far as Thorfinn is concerned. In 2001–2002, researchers discovered a huge longhouse buried underground in Glaumbaer. The floor was found in a layer of rock that put the date at about A.D. 1104, and we can be certain about that because it’s discolored by the remains of an eruption by Mount Hekla. 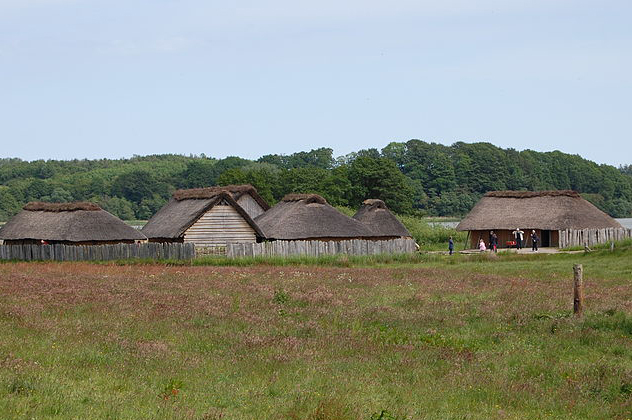 The longhouse is massive, about 30 meters (100 ft) by 8 meters (25.5 ft), which suggests that it belonged to someone pretty powerful—like Thorfinn Karlsefni. The design of the longhouse is also pretty distinct. It’s definitely Viking in origin, but it has a structure that’s more similar to the contemporary houses found in Newfoundland than those found in areas more native to the Viking culture. While it’s still not 100 percent certain that the settlement did belong to Thorfinn and his family, all the evidence falls into place. According to the sagas, Thorfinn and his wife left the New World, settled somewhere in Iceland, and raised an entire clan. Finding the settlement where they lived out their days would be an incredible historical achievement. Another long-held debate is who the first people to make the trip across the Atlantic were. 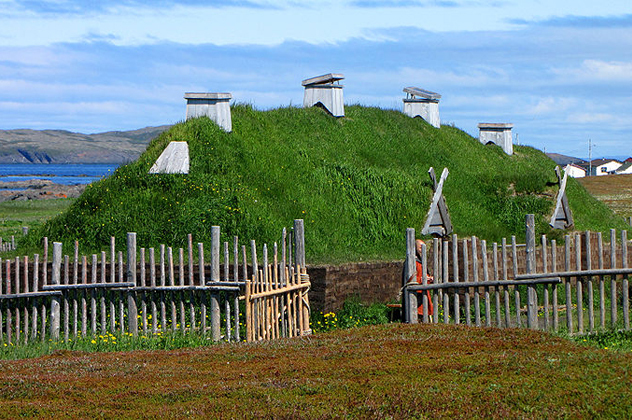 Currently, the ancient settlement in Newfoundland seems to be the front-runner for one of the earliest European presences in North America, and it’s a fascinating look into 11th-century Viking culture. The site is incredibly well preserved, and it’s thought to have been occupied until at least 1500. Homes and workshops are built with the same style and method as contemporary buildings in Iceland and Greenland, and excavations have shown that not only was it a Viking settlement, but it was occupied by humans as far back as 5,000 years ago. The Viking era has yielded four buildings that are thought to have been used as workshops, a forge, and eight houses. Forged pieces of ironwork have been found on the site, including a lot of domestic items like nails and buckets. It’s not certain how long the site was occupied, or whether it was a seasonal outpost, but it was given the name of “Leif’s Camp” because of its connection with the infamous Leif Eriksson. We know that body modification is far from a new idea, but recent finds show that the Vikings took it to whole new levels of painful. 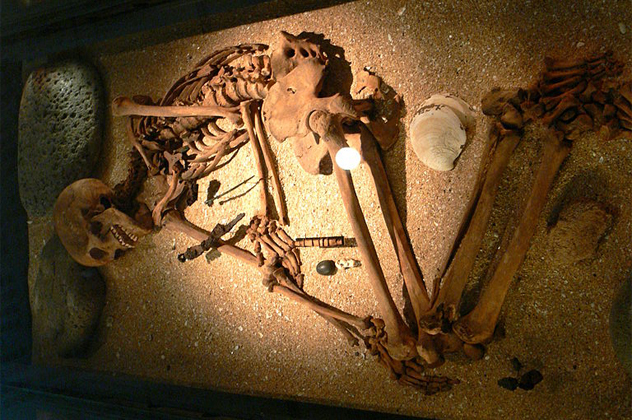 In 2009, a mass grave of Viking warriors was discovered in Dorset, England. Oxford University archaeologists tasked with studying the remains found something incredibly strange—their teeth had been filed, with incredible precision, to create patterns etched deep into the enamel. The patterns were so intricate and so carefully done that it’s believed they were the work of a craftsman skilled in the art of filing. Not only would the process have been too difficult for someone to do to themselves, it would also have been way too painful. According to the Swedish National Heritage Board, there are a huge amount of teeth with similar markings found in the Viking cemetery located at Kopparsvik, Gotland. The procedure seems to have taken off sometime around the 10th century, and the types of etchings seem to have been up to the person. Some teeth have only a mark or two dug on their upper front teeth, while others have up to four marks. It’s not clear whether it was done for intimidation, as a status symbol, or just to show just how worthy a fighter the person was. Archaeologists have also guessed that the Vikings may have filled in the grooves with charcoal or other substances to make them even more prominent. According to the stories, the Vikings were such amazing sailors that they could find the Sun even on cloudy days, and they were always able to navigate by it. It seems unlikely, if not impossible, but according to some intriguing new discoveries, it might be the truth. It all has to do with being incredibly observant when it comes to the ways sunlight reacts when it hits a stone called Icelandic spar. When the crystal is held up to the light, it reacts in different ways based on where the Sun is positioned. Carefully observing how the crystal reacts to the Sun when it’s visible allowed Viking navigators to do the same on cloudy days—they just had to look a little bit closer. 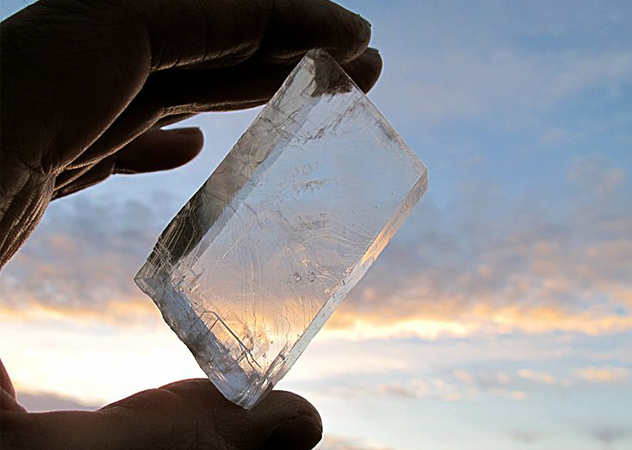 Icelandic spar essentially depolarizes the light that comes into contact with it. Holding it up to the light and then moving it away results in a brief visual phenomenon called Haidinger’s brush. The light briefly turns into a yellow line that points directly to the position of the Sun. It works even on a cloudy day, accurate down to 1 degree. The only trace we’ve found of Icelandic spar used in conjunction with sea voyages was on a ship that was once part of the Spanish Armada and was sunk in 1592. Even though magnetic compasses were well known at the time, it’s thought that the Icelandic spar retained a lot of its usefulness, especially considering that the presence of other magnetic objects wouldn’t interfere with it. Perhaps some of the most enduring images of the Vikings are their burials: Warriors were sent on a final journey in a ship set on fire. That wasn’t always the case, though, as shown by a recent discovery of a Viking chieftain who was buried on a remote peninsula of the Scottish Highlands. Dating to around the 10th century, the burial site was the final resting place of a Viking whose companions honored what modern archaeologists say was a pretty incredible life of traveling. Buried with him were his weapons, along with a pin from Ireland, a drinking horn, and a whetstone from Norway. The weapons were mostly identifiable only from the remaining iron pieces, as the wood had long ago rotted away. He had been laid to rest in a typical Viking boat which, although also long rotted, had left impressions in the soil and a layer of iron rivets. It’s not clear just what the man was (guesses range from a chieftain to someone perhaps renowned for his navigational skills), but they’re sure that the burial process was one that was reserved for only the most revered of men. Other finds in the area reveal that the remote peninsula—which is more accessible by crossing the stormy seas than by crossing the land—was a sacred burial ground for thousands of years, with graves dating as far back as 6,000 years. 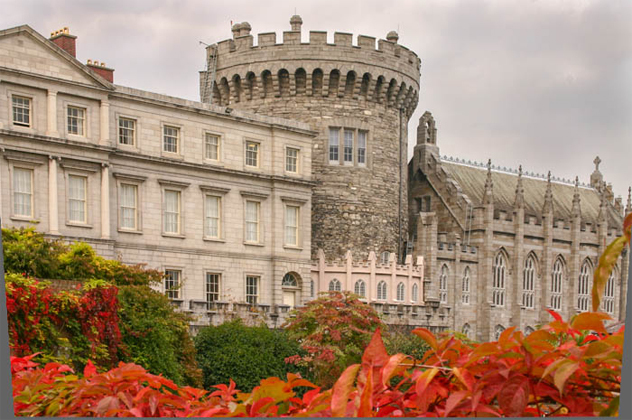 Walk the streets of Dublin today and you’ll find a city sagging under the rich weight of history. It’s an ancient history, one that dates back to a time when the Vikings settled into what must have been a virtual paradise on Earth for the hard-living people. The Vikings explored vast amounts of Europe and North America, but they eventually settled into the land that would eventually become Dublin. At the time, its relatively mild climate, thick tree cover, and river made it the perfect location for a winter home. There they repaired their ships and set up a trade network. The number of Viking relics found in Dublin over the years has been staggering. Temple Lane was created by Viking settlers and has been called the oldest street in Dublin. Viking swords have been found in the area around Christchurch, and the earliest foundations of Dublin Castle are clay floors that were also dated to the Viking era. And just south of the River Liffey is a huge concentration of buildings that seem to indicate the center of the Viking settlement, including houses and buildings once used for metalworking and the production of other commodities like leathers, textiles, and jewelry. Also along the area of the Liffey was evidence of amber-working. In the area around Kilmainham, more than 50 Viking graves have been excavated. Some of the bones present a pretty fascinating story, with Scandinavian Vikings buried alongside Vikings who spent much of their lives farther to the west, in Scotland or Ireland. It’s easy to picture Vikings as an equal-class society—there were seamen, raiders, and pillagers, and they had their families waiting at home (or sometimes, they took their women with them). But excavations of the graves of Vikings who died back at home show something that’s just as fascinating as those who were buried overseas. When they were at home, Vikings were farmers. They worked the land, but they didn’t do it alone—part of the reason for their raids was to bring back slaves, called thralls, who would work the land with them. 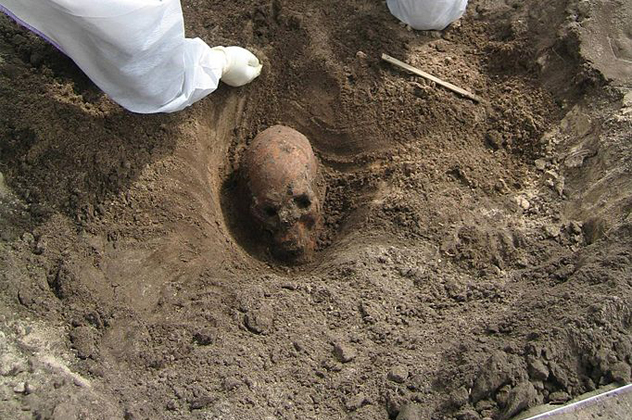 And new evidence shows that when they died, their slaves died, too. Graves in Norway dug between 400 and 1050 have revealed not only that many Vikings were buried with their thralls—who were often beheaded before joining their masters in the grave—but also that there was very definitely a class structure and a difference in the lives that were led by the Viking thralls. The diet of the upper class was more rooted in meats and vegetables, while the skeletons of the thralls reveal that they were reduced to eating mostly fish. Fish was plentiful and cheap, but the meat that came from animals had a religious, sacred context more befitting the upper class. Many of the thralls also show signs that they weren’t just killed—they were sacrificed. Graves with numerous thralls show signs of a sacrificial procedure to their deaths, including the binding of their hands and feet. Archaeologists believe that this was done as a way of honoring the dead. When we picture ancient and medieval towns, we tend to think of everything in one place with a very defined section being home to the elite. The recent discovery of an ancient Viking town seems to show that they did things a little differently. It’s thought that this newly discovered town, located in what’s now the northern part of Germany, is a stronghold that was always thought of as perhaps only a mythical creation. Recorded in the Royal Frankish Annals, Sliasthorp was said to be the stronghold of some of the ancient Viking and Danish kings, beginning with King Godfred. Archaeologists have found that the city dates back to around A.D. 700 and was occupied until around 1000. Found on the site were about 200 homes, along with all the typical relics like coins and jewelry. There was also a 30-meter (98 ft) longhouse which was presumably used for military planning. The site was the home of the military and the elite, the rich and powerful of the civilization. There were no merchants, craftsmen, or traders—those people lived in Hedeby, about 4 kilometers (2.5 mi) away. Hedeby was founded about 100 years after Sliasthorp as a port city and trading hub. If you wanted to visit Sliasthorp, you would have needed to get permission from those who lived there, suggesting that there was a very, very clear division between the classes that it was quite purposefully separated by distance. Based on the positioning of the cities, the commodities there, and the classes of people that they were home to, archaeologists believe that the cities are signs of a very carefully developed plan of urban growth and development. 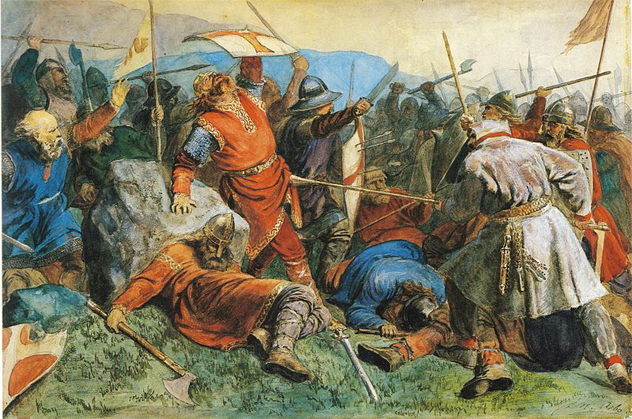 The beginning of the Viking era is usually given a very precise date—June 8, 793. That’s the date that was assigned to the first Viking conquest, the siege of a monastery off the coast of England. 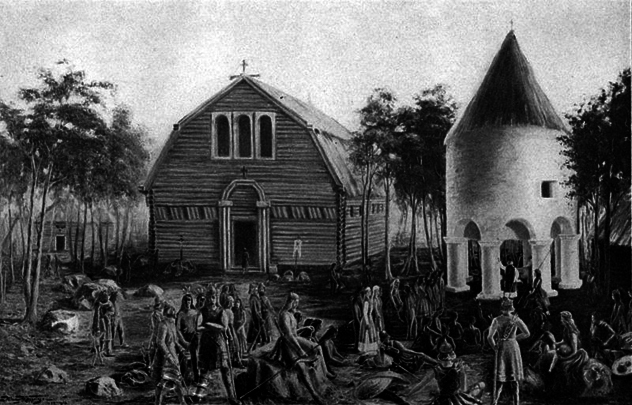 But a dig on the island of Saaremaa in Estonia suggests that the culture had its roots a lot earlier than we think. The mass grave has yielded two boats and 33 men, all Scandinavian and all with signs of having been killed in what was probably an ill-fated raid. The site has been dated to between 700 and 750, much earlier than the Viking raid on the English island. Like many other Viking boats, most of these had rotted away. The presence of the iron rivets that still remain in the soil, though, allowed for the reconstruction of the craft. That pushes back the time frame of early Viking expansion by about 120 years, and it may even change what we know about the history of sailing itself. Along with the original find came a larger craft, one that was powered with sails rather than oars. It’s long been thought that the era of sailing came much later, but this second craft has proven that the Vikings were mastering the seas long before they were originally credited with doing so. 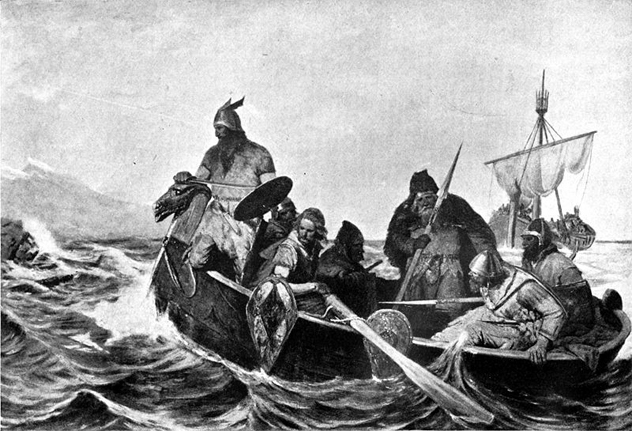 Archaeologists have been able to piece together a little of what happened on the raid, which would have taken place after the early Vikings crossed a sea about 160 kilometers (100 mi) wide. After a skirmish, the remaining Viking warriors gathered the bodies of their dead for a ceremonial burial: They entombed the bodies with their ships, covered them with their shields, and broke or bent their swords. The actual circumstances of the mass burial are still a mystery, and it’s only known that it was something of a hurried job. In addition to having established a settlement in what is now Canada, researchers have also confirmed that there was considerable interaction between the Vikings and the native population of the time—all thanks to a couple rocks. Jasper artifacts were recovered from the aforementioned L’Anse aux Meadows Viking settlement, and they were also found in Newfoundland on the other side of Notre Dame Bay. The distinctive artifacts were used by Vikings to light fires. And since we already know that the area was inhabited by a tribe of hunter-gatherers, it’s logical that this would have been the first meeting place between Europeans and North Americans. And they probably did more than just meet. 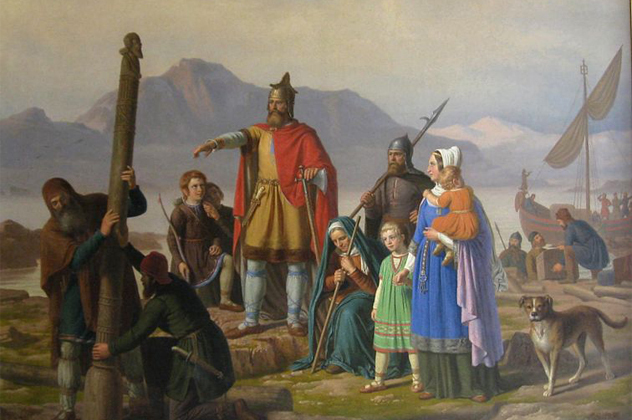 DNA analysis from a group of families living in Iceland has shown that a percentage of Scandinavian people have a genetic marker that indicates that, somewhere in their past, they had a female Native American ancestor. The DNA marker is a very distinct one that is unlikely to have developed in two different areas of the world independently. The origin of the marker has been traced back at least 300 years, meaning that the logical explanation for its appearance is that the Vikings brought at least one Native American woman back home with them.